This portrait of a Friesian horse in bright red showcases the breeds' intelligent eye and excellent facial bone structure. 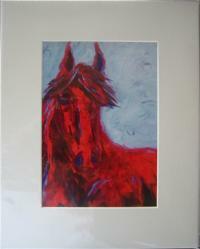 Every horse lover will enjoy this bold picture with the unusual color palette. 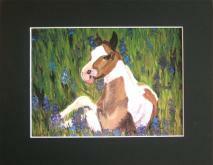 TheHorseStudio.com review: Linda's work is enchanting. Her sense of color is amazing, the blends with deft brush strokes are very engaging.These equine portraits all have a romantic air, the colors are soft and kind and the horse's all have a happy, kind expression, that makes you want to reach in and hug them. 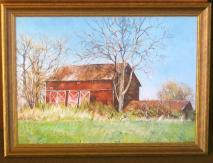 This is a 5" x 7" print hand finished with a medium varnish to add depth and the texture of brush strokes. It includes the off white beveled matt which is 8" x 10" and will fit any pre-made frames. This is from my original acrylic painting called Fresian Blue and Yellow. The print is signed and shipped in a clear protective sleeve in a cardboard mailer. I have wanted to be a horse trainer and artist since I was a little girl. furniture designer for a family furniture business. showroom has been shopped by Sherwin Williams to determine current color forecasts. I enjoy my two beautiful children and husband and find time to ride 4-5 days a week. represented by galleries both in Orinda and Berkeley, CA. COTS (committee on the shelterless) and this year the SPCA. I love painting and to experiment with color and texture. It is a true joy in life that I hope comes through in my art.